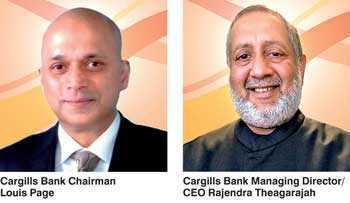 In its third year of operations, Cargills Bank achieved a satisfactory Profit before Tax of Rs. 621 million, which included a substantial one-off gain of Rs. 410 million. The Bank’s Net Interest Income grew 55% to reach Rs. 1.48 billion, whilst Net Fee and Commission Income increased by 43% to Rs. 114 million during the year, with other sources of income (excluding the gain from disposal of its subsidiary) growing by 109% to Rs. 121 million at year-end. These revenue increases saw the bank’s Total Operating Income growing substantially from its previous level to Rs. 2.2 billion for the year, enabling it to achieve a Profit Before Tax of Rs. 211 million (when the net gain of Rs. 410 million from disposal of its subsidiary is excluded). It is heartening that the contribution to this performance came from growth in activity across all core segments of the bank supported by synergies from its strong association with the Cargills Group. Total loans and advances of the bank grew by 55% to reach Rs. 20.8 billion whilst deposit portfolio doubled from Rs. 9.4 billion to Rs. 18.8 billion during the year. The CASA mix stood at 22% at year end. Total asset base of the bank stood at Rs. 32.5 billion as at end of 2017. The bank opened three new instore branches in Wattala, Ratnapura and Kaduruwela, bringing the total number of stand-alone branches to 17 whilst the total number of contact points stood at over 350. The year under review saw progress with “Cargills Cash”, enabling customers to “Experience the New Way to Bank”. This unique value proposition offers customers the opportunity to deposit, remit or withdraw cash from over 350 Cargills Food City (CFC) Outlets with the use of their Mobile Banking App. The remittance facility allows cash remittances even to non-account holders of Cargills Bank, offering them the convenience to collect cash from their Bank or from over 350 CFC outlets. It is encouraging that, in line with the bank’s strategic focus, transactions at the CFC counters during the year exceeded Rs. 4 billion in value. The Mobile Banking App which is one of the USPs of the Bank enables customers to make Utility Bill Payments, CEFT / SLIPS transfers, Standing Orders, Open Accounts and Fixed Deposits. Beyond this, the Bank launched Sri Lanka’s first contactless Mastercard branded Debit card with EMV Compliant Chip and PIN Technology which enables customer convenience with enhanced security. In a world in which digital banking is becoming the preferred channel for banking, an organisation’s website is the most important touch point. We are encouraged by the recognition received for our new Life Style Banking web site from The Financial Brand as one of the “Top 20 Visually Stunning Website Designs” among Banks and Credit Unions in the world. The Cargills Bank’s model is one which offers a unique value proposition in reaching towards its Vision “to be the most inclusive bank, harnessing the spirit of progress in every Sri Lankan”. A key strategic priority towards this is accessibility for the rural population and others who have hitherto been excluded from the country’s formal banking system. The Cargills Food City Model offers a win-win value proposition to both consumer and farmer, with a reach to the farmer that facilitates greater income generation for him and better prices for the consumer. In the same manner Cargills Bank aims to relieve the hitherto unbanked from the burden of borrowing from the informal sector whilst supporting the small and medium scale sectors in their entrepreneurship. Being integrated into local communities will hence be a key element of how we engage with our social capital. As a retail centric bank, Cargills Bank offers a unique value proposition and harnesses synergies from the Cargills Group – its brand heritage and its retail strength, encompassing 350 Food City outlets spread across the length and breadth of the country. The bank is working towards listing its shares in the Colombo Stock Exchange in 2020.